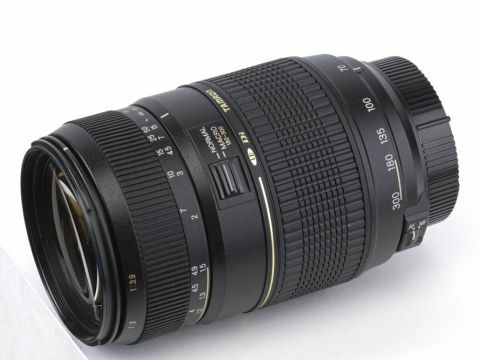 One of Tamron's Digitally Integrated (Di) lenses, the AF 70-300mm f/4-5.6 Di LD Macro is designed for use on both full-frame and APS-C-sized cameras. It's available in Canon, Nikon, Pentax and Sony fit and, on APS-C bodies, the effective zoom range is 105-450mm or, for Canon cameras, a slightly longer 112-480mm. For Nikon users, one point worth noting is that the original Nikon-fit version of this lens, made before February 2008, didn't feature a built-in autofocus motor, so can't autofocus on bodies such as the D3100 and D5100. Unlike Tamron's newer SP 70-300mm VC USD // lens, this one also lacks an optical stabiliser. The optical design is based on 13 elements in nine groups, with a nine-blade diaphragm that enables an aperture range of f/4-5.6 to f/32-45. The smaller than usual minimum aperture is useful for extending depth of field in macro mode. The macro facility is available in the 180-300mm focal length range, via a switch on the lens barrel, and offers a maximum 0.5x magnification when shooting at 300mm and the shortest focus distance of 95cm. It's a feature that's quite uncommon on telephoto zoom lenses but is shared by the Sigma 70-300mm APO Macro lens. Autofocus is of the standard electric motor type, rather than Tamron's newer Piezo Drive (PZD) or Ultrasonic Silent Drive (USD) systems featured on some of its latest lenses, the latter being fitted to the Tamron SP 70-300mm VC USD. The Tamron AF 70-300mm f/4-5.6 Di LD Macro lens also lacks internal focusing, so the front element extends and rotates during focusing.